Andrew Hood remembers his first visit to Sicily and celebrates the island's diverse flavor as the Giro d'Italia rolls on to the mainland. PALERMO, Italy (VN) — My first trip to Sicily was pre-GPS in the early 2000s. Desperately lost in the chaos of downtown Palermo on a congested one-way street, I yelled over honking horns to ask a policeman how to get to my hotel. Ah, Sicily. I’ve missed you. The Giro d’Italia returned to Italy on Monday following three controversial and equally fascinating days in Israel. Perhaps it was only fitting that its first stop back in “bella Italia” would be on its most beguiling of islands. I didn’t see anyone kissing the ground when we landed in Catania, but everyone was “contentissimo” to have their first real cappuccino in days and sink their teeth into a homemade cannolo. There was a general mood around the race entourage that the Giro could now officially start. Sicily has an otherworldly atmosphere about it that makes the island feel more like its own continent. Yes, it’s part of Italy and, through extension, Europe. But it’s closer to Africa than it is to Rome. There’s nowhere quite like it in the Mediterranean. Its streets are packed with more flavors, smells, sites, history, culture, and amazing food than anywhere else in Italy. Only its warm and welcoming people match the island’s exuberance. 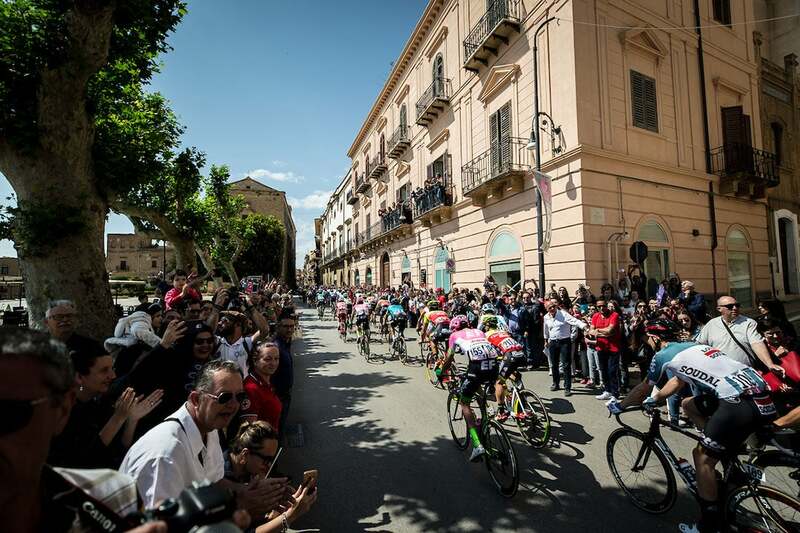 The Giro is no stranger to Sicily. Its first stop came in 1930, and it been here nearly 20 times since then. My first Giro visit to Sicily was in 2008 when my wife and I came a week early to tour the island. From Cerfalù to Taormina, to the smoldering Etna summit to the spectacular Greek ruins at Agrigento, we were dazzled at every turn. Move it higher on your bucket-list if you haven’t already been. Sicilians love to tell stories. We spent one night in the village of Corleone. Yes, that Corleone. Despite its own “Godfather” bar and mafia museum, it’s an otherwise ramshackle Sicilian town lost in the sea of meadows and craggy peaks. A few tourists drift through during the day, but by night, Corleone returns to its sleepy rural rhythms. Our hotel owner that night told a rambling, long story over yet another mind-blowingly delicious dinner how Al Pacino and Diane Keaton stayed there for several nights when they were filming scenes from “The Godfather, Part III” in the late 1980s. According to our enthusiastic host, Pacino’s mom was actually from the village, but the actor kept it quiet back in the 1970s for fear the Italian connection might somehow jeopardize his chances of snagging what would be his breakout role as the godfather’s youngest son. Growing up in New York, Pacino never had contact with his Italian relatives, but quietly put out the word that he wanted to meet some of his long-lost cousins. One of the movie’s assistants tracked down someone and showed up unannounced to say that the Hollywood legend was waiting to meet the family that night. According to the story, the cousin was incredulous and refused to go, “I don’t want to interrupt my dinner! If he wants to see us after so much time, let the big movie star come here!” Pacino waited for hours but no one ever showed up. When other family members later heard about the snub, they implored the cousin to go back hat in hand. Evidently, Pacino was so upset by the snub he refused another chance to meet his long-lost “paisano.” Who knows if the story is true, but it sure was a good yarn. A few days later, we were down at Mondello for the opening team time trial. Almost by divine intervention, the then-upstart Garmin team won and Christian Vande Velde earned the first pink jersey. With the long post-race protocol, the team somehow got its wires crossed, and left him stranded alone at the finish line. Imagine the surprise when Vande Velde had to hail a taxi for a ride back to the team hotel. Mamma mia, this wasn’t a tourist, but the real maglia rosa! 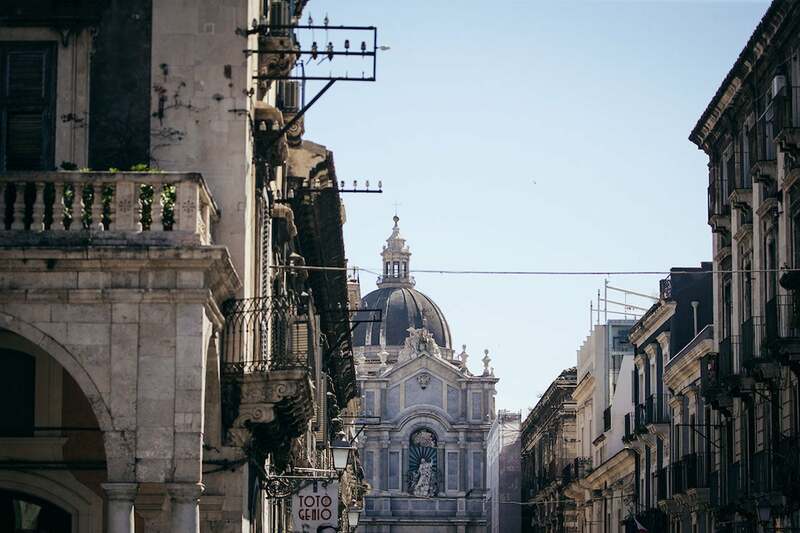 The next morning, Vande Velde and the rest of the team nearly missed the start of the stage after getting lost in the maze of streets and traffic in downtown Palermo. Flash forward to Thursday, and the peloton climbed Etna, one of the world’s highest active volcanoes. The stage was true modern Giro; extreme racing in extreme logistical conditions. Year after year, somehow the Giro keeps managing to pull it off. Long after the stage, everyone headed down off the rocky cone, drove two hours to Messina, jumped on a ferry for a night crossing, and left Sicily simmering in the rearview mirror. The Giro should come back more often. There’s no place more Italian than Sicily. A Giro without Sicily almost feels incomplete.